Over the Easter long weekend my parents went on a spring cleaning spree. They cleared out old boxes and did what the organizing pros suggest – created a keep, give to charity and throw away pile. In the keep pile, they kindly set aside a box of things I had packed away many years ago. These two have stood the test of time a whole lot better than Little Miss Magic Curl up there. The bald one is named Xavier (I think) but I can’t remember the little brunette’s name! Of course their adoptions papers are long gone. The funny thing about those notes I kept is that I don’t remember receiving them! Obviously I kept them for a reason but I laugh that I don’t remember why. Reading through those notes got me thinking. Teenagers these days probably don’t pass notes in class anymore – they just text each other, right? I assume that much like passing notes in class, texting in class is also a big no-no. But is there really a risk of the teacher grabbing your phone and reading your text out loud for the entire class to hear? Especially when it’s a note to your friend about the cute boy who sits three rows over that you have a huge, like OMG serious crush on? 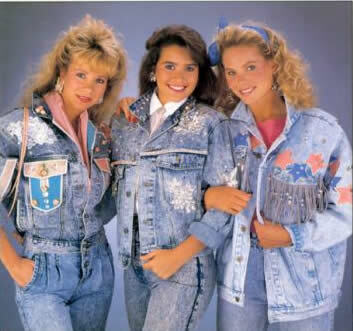 I’m going to hold onto my notes in case some day in this new Millennium, the Museum of Civilization needs artifacts representing a “teenage wasteland” of times gone past. Perhaps these notes of teenage angst and glory will take their rightful place beside displays of Garbage Pail Kids trading cards and unnecessarily high-wasted acid wash jeans. Snickering aside, all of these items I am happy to have back. And I thank my parents for holding on to them for as long as they did. 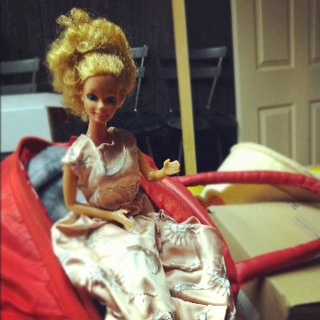 What mementos have you kept from your childhood? 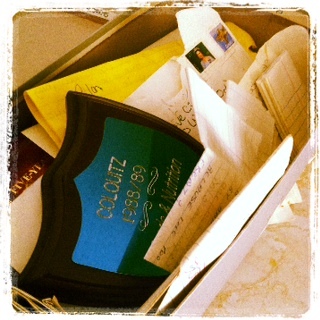 Are they stored away for some future rediscovery or have you already opened up your time capsule? 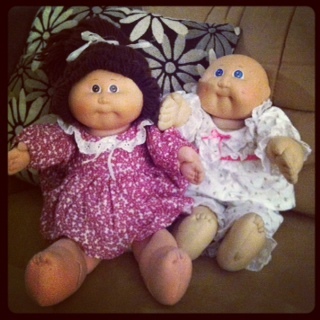 I recently dug out my Cabbage Patch Kids and my two daughters are in love with them. I have to say, it has been kind of fun playing with my old stuff with them. Yay to the Cabbage Patch! I can’t believe what good shape my two Cabbage Patch dolls are in. I mean, it’s not like I packed them away carefully. DD is in love with them. I’m glad too. It’s a bit mind-boggling to see her playing with the same dolls I did as a child.